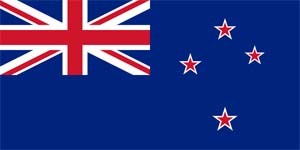 The New Zealand Flag was officially adopted on June 12, 1902. The flag's blue background represents the Pacific Ocean, the Union Jack in the upper left hand corner is the recognition that New Zealand was once a British colony and the stars of the Southern Cross emphasize its location in the South Pacific. The New Zealand Coat of Arms features four shields. The first quarter of the shield portrays four stars representing the Southern Cross, the second quarter shows a fleece which represents the farming industry, the wheat sheaf in the third quarter is a tribute to the agricultural industry and the last, (fourth) quarter with the crossed hammers recognizes the mining industry. 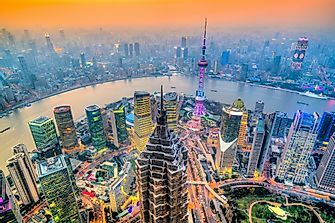 The three ships in the center of the shield symbolize the sea trade. 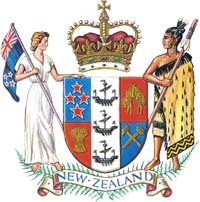 On either side of the shield is a supporter - on the right is a Maori Chieftain holding a taiaha (Maori war weapon) and the figure on the left is a European woman holding the New Zealand ensign. The Royal Warrant of 1911 gave the formal description, but by mid-1940's, there were at least 20 versions of the original design in use. The current Coat of Arms was standardized in 1956. 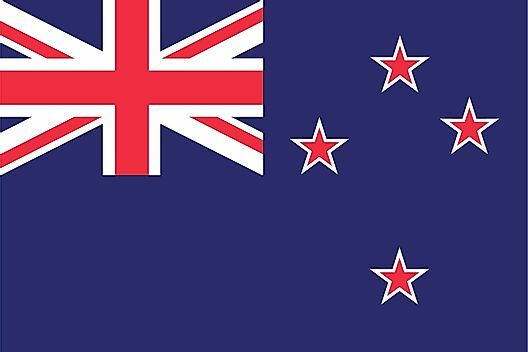 The principal alterations were in the crest (St. Edward's Crown symbolizing the fact that the Queen is Queen of New Zealand), the four quarters in the shield were redrawn, the two supporters were redrawn facing inwards, a scroll was replaced by the two fern leaves and the name "New Zealand" was added.